We love our local grocery store! Not only are the prices great, but they are wonderful about giving free products to returning customers. At the bottom of each receipt we're given a code to use to fill out an online survey about our shopping experience...was the store clean, were we greeted upon entering and leaving, were we able to find what we needed, etc. With every completed survey, we're given a coupon for free product and this month orange juice was the featured freebie. At the time, this gallon of orange goodness was $4.99 and we were able to collect quite a few coupons. That meant our fridge was filled to the brim with oj in a home where we don't normally drink a lot of the stuff. Recently in our couponing post, I talked about taking advantage of free product opportunities even if it's not something you use a lot. We love orange juice, but it can be expensive so we focus on water, tea and cranberry juice for most of our drinking needs. We were so excited when the new oj coupons came out, but I knew we couldn't drink the majority of that juice before it expired. The solution? Freezing! We already freeze broth, veggies, fruit, garlic, herbs and ginger...why not juice?! 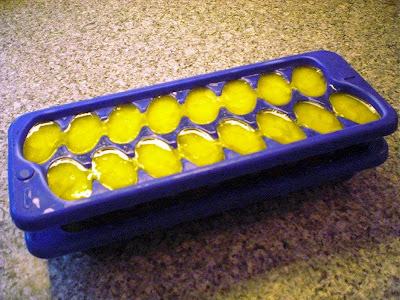 The neat thing about freezing orange juice in ice cube trays is that the smaller amounts can be used quite easily. Whenever you need juice for a drink, simply place the frozen cubes in a pitcher and the next day you'll have fresh oj for breakfast! Our favorite thing is to add a few cubes into morning smoothies. It takes the place of ice so the smoothie isn't watered down. Another great idea is to pop several cubes in the food processor or blender along with a tablespoon of olive oil, fresh ginger, fresh garlic, a touch of honey, salt and pepper. It makes an amazing sauce to pour over chicken breasts cooked in the oven. Yum! For a twist on a healthy summer treat, put popsicle sticks into the cubes when they're almost frozen. Once they're solid, the cubes turn into mini orange popsicles for the kids (the adults in our home love them too!). A simple dessert that's natural and so much better than processed sugar popsicles. 3. 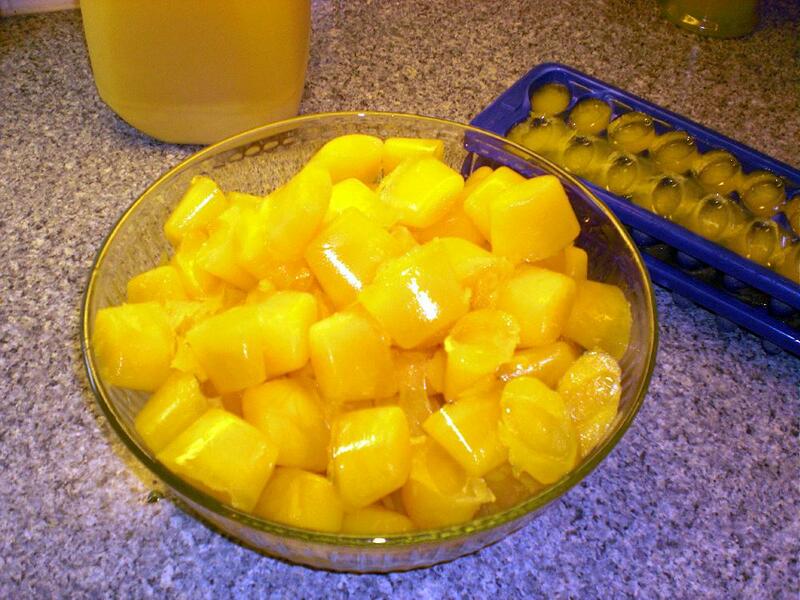 Filled Ziploc bags with oj cubes and stored them in the freezer for future use. 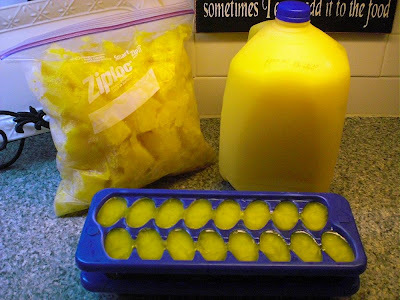 It feels like it's taken forever to freeze all that juice and to be honest, we still have quite a few more gallons waiting to be transformed into little cubes of frozen magic. Just like stocking a healthy pantry, adding to your freezer can be well worth all the hard work for months to come. Keep a look out for a new post on How to Stock a Healthy Freezer soon!